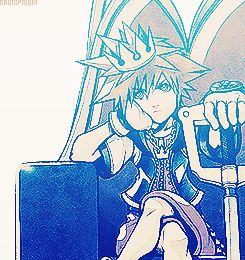 Sora is the main character in the Kingdom Hearts series. He is a 14 year old boy who lives in Destiny Islands. 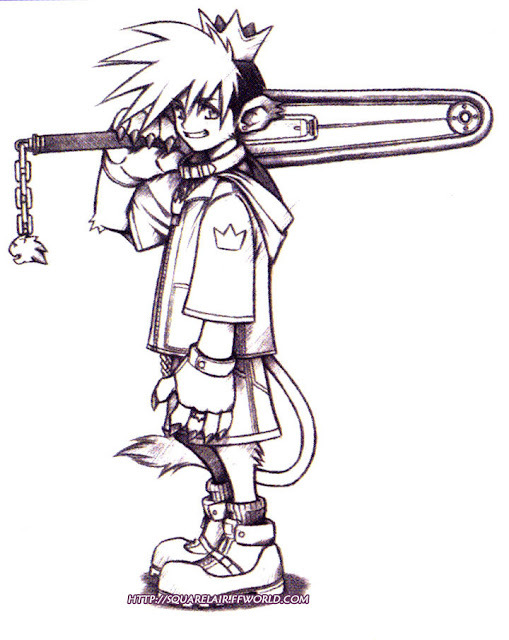 In Birth by Sleep, he's four, in KH II, fifteen. 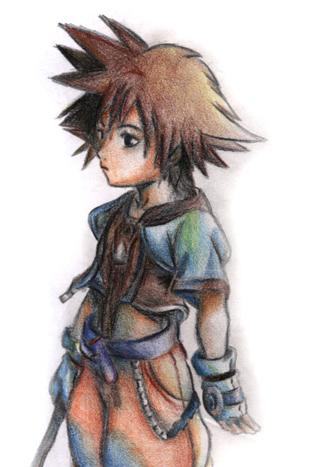 He spent his whole life in the islands, with Riku and Kairi. 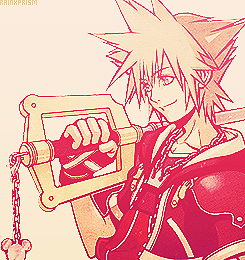 Ventus's heart is inside him, and because of this, he is able to wield the keyblade. The first picture is his original design, where he was supposed to be a mix between a boy and a lion, and used a kind of chainsaw as weapon. 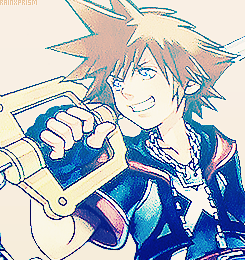 He is, above everything else, loyal to his friends, and would do anything to save Riku and Kairi, Donald, Goofy and everyone else he meets, as well as his home. 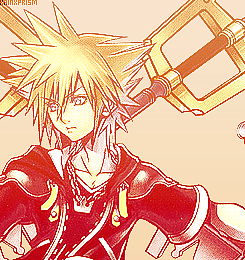 He had a nobody, Roxas, turned into a heartless for a short period of time in Hollow Bastion, in the end of KH I. 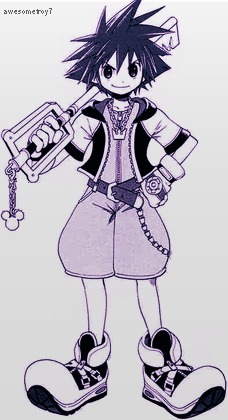 In KH:CoM, his memories of Kairi were stolen from him and created Xion. 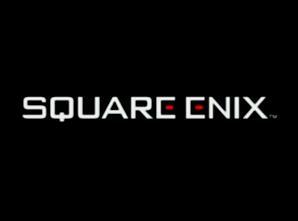 He spent a year sleeping, between CoM and KH II, while Naminé returned his memories to normal, after his experience in castle Oblivion, and during this time, he was reunited with Xion and Roxas. 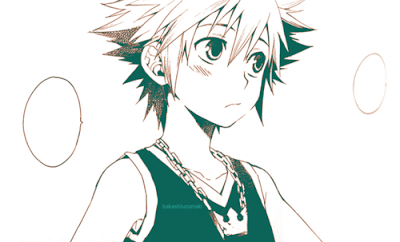 After he awakened, he set off on another journey, looking for Riku and helping return the worlds to normal. 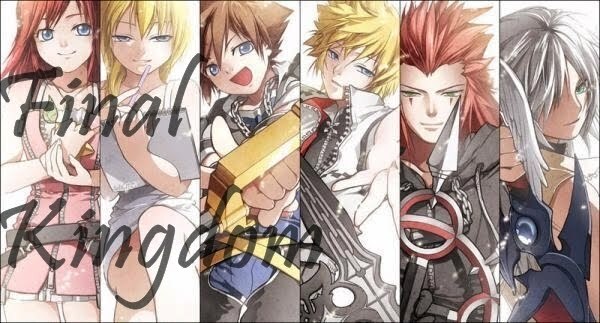 Sora, in CoM and KH II, kills almost every member of Organization XIII, all of them except Lexaeus, Vexen, Axel, Zexion, and Roxas and Xion, obviously u.u. His name means "Sky" in japanese, relating him to Ventus again, whose name means "wind"
Sora In a doujinshi, "walking togheter"
Sora as he appears in the KH mangá.